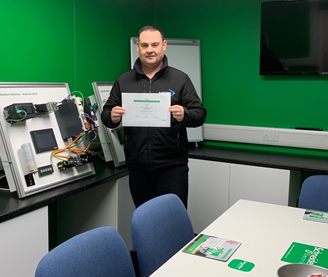 The Rexel Industrial Solutions Deeside branch has become the fifth UK Industrial Automation Distributor (IAD) under an initiative from Schneider Electric, making it the first within the Rexel network to receive the accolade. Designed and developed by Schneider Electric’s Industry division, the scheme is part of a Channel Segmentation Strategy Plan for the establishment of ‘Master’ Partners. It sets out to make a step change in its automation specification and services, offering the highest level of technical training and support for its customers, including end users and OEMs. IAD status is given to electrical distributors that meet a range of specified criteria, while demonstrating a high level of competence with training and technical knowledge of a wide range of control and automation products, including programmable logic controllers (PLCs) and drives. This in turn allows them to provide training to customers on how to specify the products they need and to use them effectively and safely. Training is provided by Schneider and the branch team are then assessed in a range of areas, such as offering 24/7 customer facing technical support, having an on-site qualified in-house application engineer and a certified external sales resource. Paul Dougal, Business Manager for Rexel industrial Solutions Deeside, is the first member of the team to undergo the training and gain IAD Professional Status. He said: “As a branch we are now fully authorised and equipped to offer technical support to customers at our dedicated training room here at Deeside. Our aim is to roll out the process and gain accreditation for three additional members of the team throughout 2019, so that we will be best positioned to support and serve our automation customers at the highest level and standard. As part of the initiative, Schneider Electric requires a range of criteria to be met and maintained for IAD to be awarded, which include value add, technical and go to market.